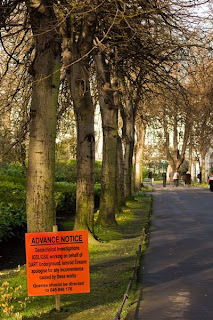 I saw signs up in St Stephens Green this morning giving advance notice of work planned for the Metro North station from the Green out to the airport and on the Swords. Personally I cant believe they ever planned to dig up St Stephens Green to build a train station when just running the Metro from O'Connell St and going ahead with the planned over ground connection of the Luas lines would have been much cheaper, far less destructive and much less disruptive. There is an existing Luas line from O'Connell Street to Heuston and Connolly train stations so there should be no need to extend the Dart to St Stephens Green. In theory it may cut a couple of minutes off some peoples public transport journey from Sandyford to Cork or the Airport but is that worth the investment? Would it really be such a hardship to expect people to stay on the Luas an extra 2 minutes all the way to O'Connell St and then switch to the other Luas line or onto the Metro? Given the current economic down turn the cynical part of me thinks the only reason to push ahead with an expensive plan to extend the Metro line under the Liffey and connect it with a new Dart and train extension from Heuston and Connolly is because the new station would be a two minute walk from the Dail. Of course it's all ok because as the sign says they "apologise for any inconvenience". Save the money, save the Green. Put the money into a decent bus and tram service in Dublin and around the country as a whole. This work has to be done otherwise the green Luas line was a waste of money. The original intention was for a metro line running from swords through the city centre and on south along what is now the green luas. Fianna Fail (Mary O'Rourke was the minister at the time) lacked the cojones to approve the scheme so they went for a half assed alternative. Build the luas green line using trams instead of metro carraiges and only run it to St Stephens green. Then punt the decision of completing it, to another day. But the green line was designed by the RPA all along to be upgraded to full metro. If the public didn't have such short memories they would know this is why the two luas lines were never intended to be connected together. If the red and green lines are connected then the green line will remain as a glorified tram line forever more. With the metro running to Stephens green then it will be a relativly small step to connect it to the green line and finally give us the full (high capacity) north south metro the city has been waiting for for years. Part of me agrees with the idea of a high capacity metro but its very nature limits the access by pumping all the investment into one big line rather than 2 or 3 smaller capacity ones.